Classic French Butter Cake Madeleine Recipe. 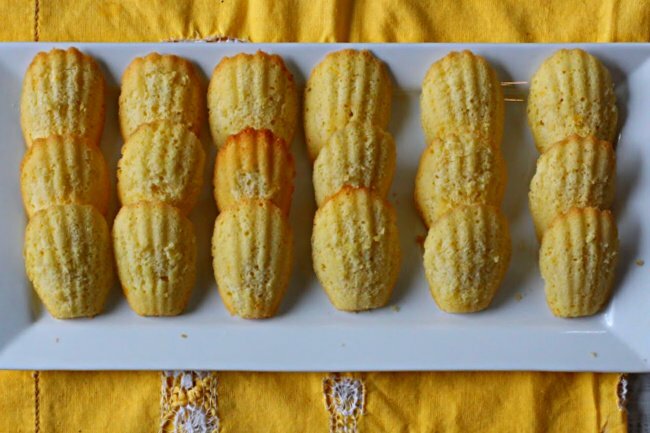 Madeleines are light and lemony and simple to make if you follow the directions carefully. You’ll be rewarded with unique little cakes that are a little crispy on the outside and spongy on the inside. Even though small and cookie size, Madeleines really aren’t cookies at all, but are a traditional very small French sponge cake with a distinctive shell-like shape. They were actually categorized as Petit Fours in Culinary School. A Petit Four is a small bite-sized confectionery or savory appetizer. The Madeleine shape is achieved by a using a pan with shell shaped molds. 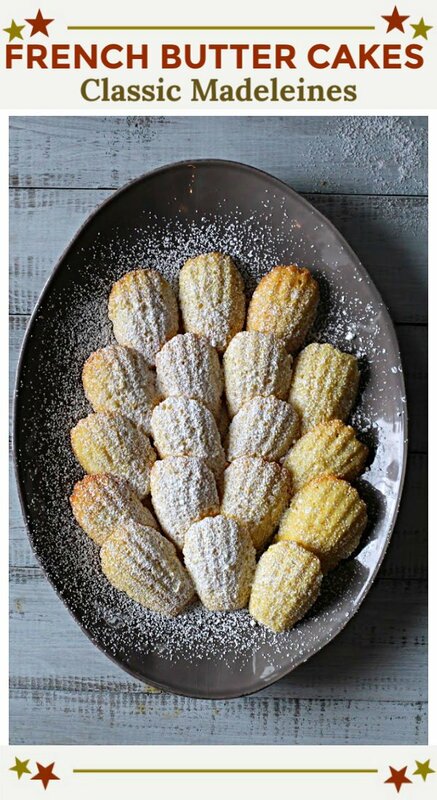 Madeleines are popular little tea and dessert cakes that are delightful to look at and lovely to eat. If you’ve followed my blog for a few years, you’ll know I’m not much of a baker. That is, until I attended Cook Street Culinary School in 2017. The time spent in the Pastry Kitchen was an incredibly valuable piece of my extensive education there. My first weeks at school, I was assigned to the Pastry Kitchen under the direction of Jenna Dilullo, a very skilled pastry chef. 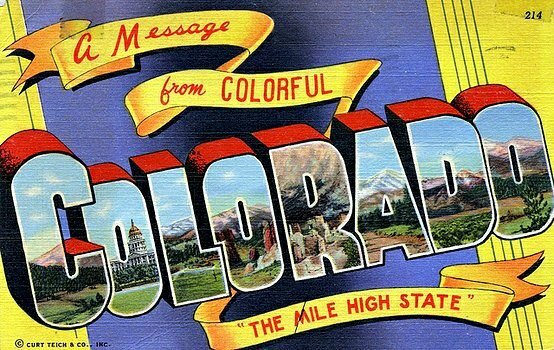 Jenna studied at Johnson and Wales and at the Culinary Institute before landing in Denver. Being trained in the Pastry Kitchen meant arriving at 6:30 a.m. every morning. On entering the Pastry Kitchen, I’d find the day’s tasks written on the tiled walls in black marker. After studying the lineup, reading the recipes twice, we’d time block, organize and gather equipment to have each assignment completed by around 12:30 or 1:00 p.m. A lofty task since the assignment sheet included 2 – 3 loaves of bread, a couple of desserts and perhaps a pastry, or two. It was a great challenge but rewarding challenge to complete the list and a delicious end to a day flour filled day. The morning French Madeleines were written on that wall, I became really nervous. “French”. Difficult, fussy and tedious came to mind. Much to my surprise, being a novice baker at the time, I found Madeleines to be fairly easy. I was extremely proud of my adorable little French cakes, and right then and there decided they would become a staple in my home kitchen. Since my time in Culinary School, I’ve read a couple of articles about making Madeleines with one author warning how fussy and difficult they can be to make. I simply don’t agree. Just go out and buy yourself a couple of Madeleine pans and follow instructions. They’re fun to make and popular. People seem to be drawn to their beautiful lemony color and delicate shape. And as I learned in Culinary School Pastry Kitchen – Read the recipe twice before starting, and then gather ingredients and equipment. Mise en place is not optional. And it’s a very good habit to get into when cooking anything. Also learned in Culinary School, when baking, always use a scale to measure ingredients. I found the Madeleine pan at Sur la Table. They had two Madeleine pans with two sizes of the shell molds. I bought the pan that offered the larger sized shells. That’s the size we used at school. I hope you won’t let the word “French” intimidate, and you give this Madeleine Recipe a try. It’s very rewarding, very manageable and and these small cakes are a fresh tasting dessert. 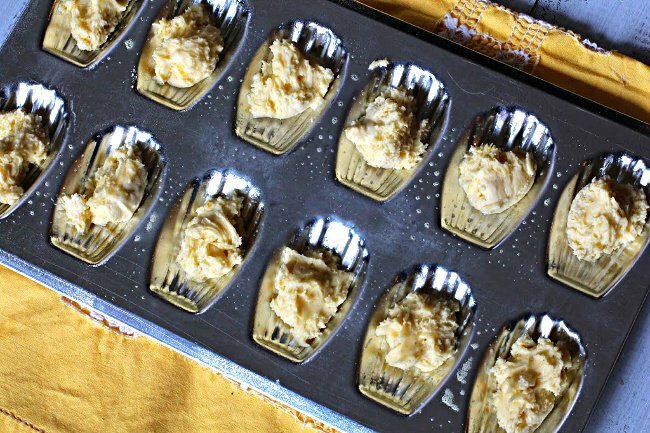 I Hope you give this Madeleine recipe a try, and if you do, please come back and give the recipe a star rating. 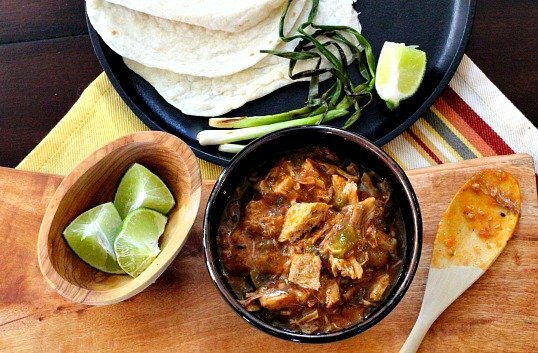 And leave a comment about your experience with the recipe. Madeleines come in many flavors, so if you’ve made them and flavored them in a unique way, let me know, I’d love to give them a try. 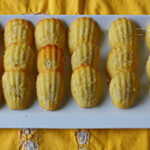 Classic French Butter Cake Madeleine Recipe. 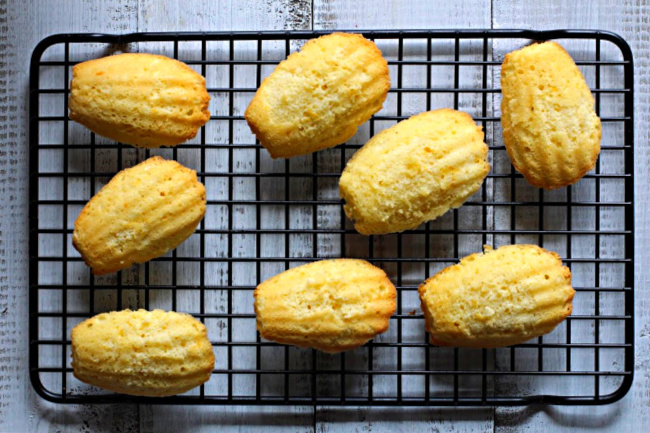 Madeleines are light and lemony and simple to make if you follow the directions carefully. You'll be rewarded with unique little cakes that are a little crispy on the outside and spongy on the inside. Whip eggs and sugar in a mixing bowl with a whip attachment until 3 x volume. Add zest and flours and fold to combine. Fold in butter until combined. Pipe into lightly greased madeleine pans, no more than 1/2 full. Bake in preheated 375 degree oven until they bounce back to the touch when the center is pressed. This will take about 10 minutes. Let cool 5 minutes then turn out of the pans. An affiliate link to the Madeleine pan has been included in this post. I participate in the Amazon Affiliate Program. If you purchase the pan using the link provided, I make a small commission at no extra charge to you. These are gorgeous Lea Ann! Lea Ann, I love madeleines and yours look perfect. I, too, am an Amazon affiliate, but haven’t found it very profitable. I’m glad you mentioned it. I’ve put a note on my computer to start my Amazon shopping from your website so you can get the commission. We can’t get a commission on our own purchases, so we might as well let someone else! I have metal Madeleine pans, not the non-stick. Do you grease them with butter? These look so good! Perfect ending to my rather heavy, steak Valentine’s Day dinner! I’ve been baking madeleines since Zoe made them for extra credit in Frenvh class. We love them. Besides the basic I’ve also made them with rosewater and they were fabulous. Plus they keep a long time! Nice post. Madeleines are great! And you’re right — they’re not hard to make. Plus their shape is adorable. Terrific post — thanks.